Diane Gilleland had a chat with Stephen Fraser about Spoonflower, the new on demand fabric printing service. The interview is here on Craftsylish. We get a peek inside the business through her thoughtful questions. Wow. He mentions me! (To find the mentioned image sites search my sidebar category, Images. Gail Bartel has written a lovely tutorial to help us to safely make Batik fabric with kids. Visit her blog, that artist woman to see how. Let her know you visited. It's the best encouragement for more tutorials! A quote from Alicia's bio:"My goal is to raise my children so that when they look back on their childhoods, they'll remember them as truly happy. Yes, there will be tough times. We can't avoid them. But I hope they'll be a little easier to take. In the meantime, letting them write their memories on the insides of their closets, giving them a round of 50 kisses and tinting their mashed potatoes blue certainly can't hurt anything." 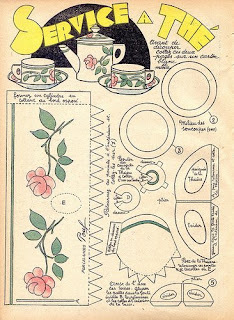 Patricia has posted this adorable paper tea set. Lovely as is or as a pattern. I see party favor, ornament or gift boxes. Maybe it would also translate into fabric. 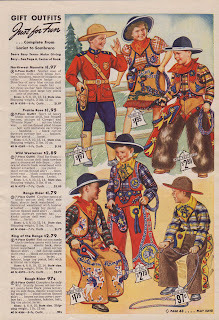 One of the things I find interesting about these vintage prints is the patterns that are used to fill in the color. Notice that the green is actually a blue and yellow overprint and the registration is slightly off. I like that. I'm so grateful that Patricia is leaving a legacy of crafting and other history. Her collection far surpasses any that are shared by libraries and she posts them to Flickr in high resolution so we can actually use them as printables. 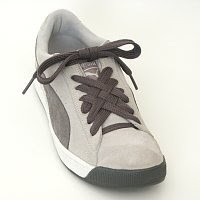 34 Different Ways To Lace Shoes with diagrams and photos from Ian's Shoelace Site - Bringing you the fun, fashion & science of shoelaces. 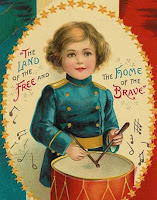 WishbookWeb.com is a vintage Christmas catalog archive project. Every page of 29 different catalogs dating 1940-1986. Downloadable templates for three cardboard toys courtesy Marmalade Pet Care, makers of luxurious cardboard cat furniture. Very cool. A couple of projects from the archives at Good Housekeeping Magazine. Both have downloadable templates. 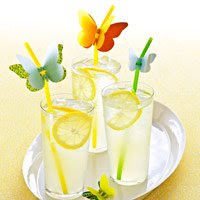 Create butterfly straws for summer drinks. An easy way to add a headboard — just paint it on! Pantone color report available as a downloadable pdf. It looks as if teal and purple are back. The color report includes designer drawings, a list of fashion must haves and designer color picks for interiors. Click on Preview colors for Fall 2008. I have been following the coversation on Dabbled about making Shrinky Dinks from plastic in your recycle bin (found via CraftyPod). 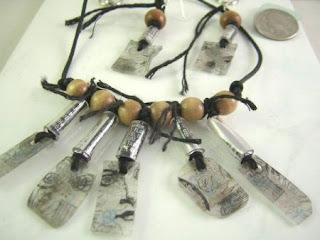 That thought led to this tutorial for Making Jewelry From Found Objects on the EBSQ Self Representing Artists site. These charms are recycled plastic shrinky and those long beads are soda can metal inside plastic tubing. Then I realize that the entire site is chock full of interesting information and that I was reading just one article in their monthly Zine. Love it. 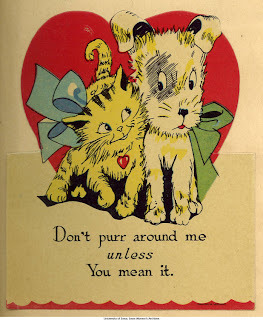 Two fun books available for download on Google Books. The tables of contents are clickable. Oregon isn't just the home of craft beer it's also the home of craft tonic water. This great recipe by Jeffrey Morgenthaler is fruity and refreshing. It uses cinchona bark as the quinine source which is the reason I drink tonic. 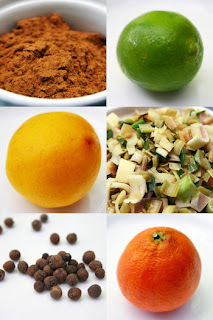 Quinine is instant relief for my leg cramps. Many years ago I was able to purchase quinine in tablet form until it became available only by prescription. I always keep tonic water around for that twice a year, middle of the night leg cramp episode. The recipe calls for agave syrup but I've used simple syrup which is much sweeter and I don't always care if I have bubbles and use plain water. Tasty cure for what ails me. Here Food Chronicler looks at Q Tonic, a premium tonic made with Peruvian quinine, Cinchona Bark. This article has good instructions for distilling your own with basic kitchen equipment. The article calls for a brick to set a bowl on but an inverted heavy bowl will work. If you have a juicer/steamer pot, it will work too. 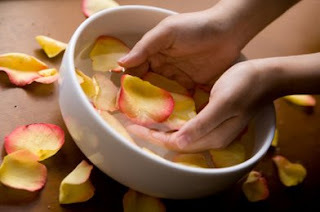 I liked one of the comments about freezing the rosewater in ice cube trays and think that is better than adding a preservative such as alcohol. This digitized collection of almost 400 Japanese woodblock prints "illustrates a wide variety of health-related topics. The prints provide a window into traditional Japanese attitudes toward illness, the human body, women, religion, and the West." Searchable; or view prints by themes such as contagious disease, drug advertisements, and religion and health. From the Library and Center for Knowledge Management at the University of California, San Francisco. This project is no longer shown on her site but her current work is interesting. I think she is using a synthetic stucco material. This sculpture project by artist Faith Schexnayder was my favorite episode of HGTV's That's Clever. Faith carved the shape from dense foam, spread on a layer of cement mixed with fiberglass fibers and then created the mosaic. Faith also makes all kinds of outdoor sculpture, signs and props with this technique. Not all get the mosaic treatment and it was the foam and cement that captured me. 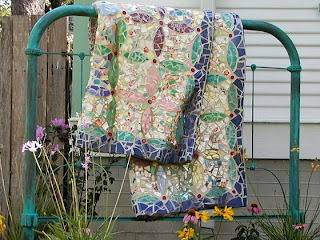 There is a tutorial online for this quilt and Faith keeps a website for her business, Flatfork Studio. My favorite section of her site is the Architectural Carving done in foam and cement. The driller has been done for more than a week. It was not an easy go of it for him as the well kept collapsing. He ended up having to case the entire depth, 500 ft., with steel. 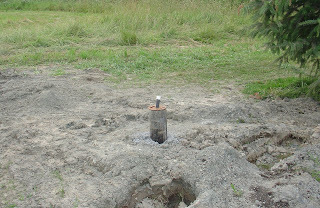 A well that doesn't collapse can have PVC pipe in the bottom half. The driller charges by the foot...no matter what. In terms of man hours and materials this job was more expensive for him than if he had hit solid rock. This is the wellhead and the mess. Click the pics for enlarged views. 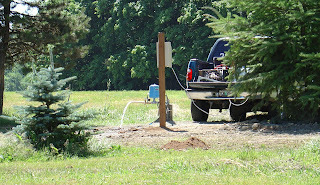 Today the pump people showed up to install the pump and pump out the well a couple of times. Look! We have water! Lots of it! Quality still unknown but I have faith. We are probably going to have to move that little blue spruce in order to get a trench to the house. At greenbeanbaby artist ELLIA ANA HILL shares a tutorial with printable templates for a cute illustration in her style. On demand publishing and manufacturing is fascinating to me. MagCloud is still in beta but you can ask for an invite. "MagCloud enables you to publish your own magazines. All you have to do is upload a PDF and we'll take care of the rest: printing, mailing, subscription management, and more. It costs you nothing to publish a magazine on MagCloud. To buy a magazine costs 20¢ per page, plus shipping. For example, a 20-page magazine would be four bucks plus shipping. And you can make money! You set your issue price and all proceeds above the base price go to you. Shipping is a flat $1.40/copy (USPS first class mail) for quantities 1-9, or a flat $13 for quantities from 10-100 (per box of 10-100). MagCloud uses HP Indigo technology, so every issue is custom-printed when it’s ordered. Printing on demand means no big print runs, which means no pre-publishing expense. Magazines are brilliant full color on 80lb paper with saddle-stitched covers. They look awesome." French web magazine Benita-Loca "The Guide to Decorating Trends, colors, ideas and know-how". All I can say is Wow! There is a focus on painted furniture but tons of creative ideas of all sorts. 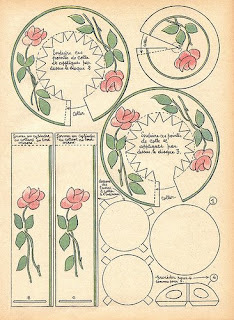 Benita also offers downloads of images and stencils. Look at the top of the right sidebar. This is just one issue. Look at Former Numbers on the lavender bar for other issues. 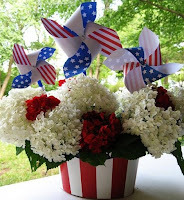 Skip to My Lou shares printable pinwheels in 3 sizes. 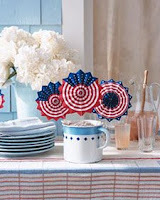 2 printable fans from Martha Stewart Living. 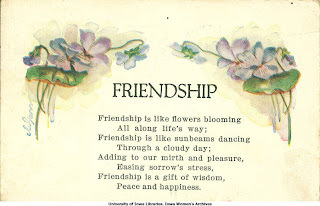 6 Victorian Postcards to print are a gift from Country Living magazine.